January is usually a transition month in local gardens. Annual wildflowers are but seedlings and most of our shrubs and trees are dormant or waiting. The few species that bloom regularly from December to February are a welcome sight. Among the plants just coming into bloom in Mother Nature’s Backyard is our Bigberry Manzanita (Arctostaphylos glauca). Manzanitas hold a special place in the hearts of many Californians. The genus Arctostaphylos has about 60 species, primarily found in western North America from British Columbia, Canada to Mexico. California has the largest number of native species; in our state, many species are common shrubs within rather small geographic ranges. Manzanitas are mostly evergreen and attractive year-round. It’s no wonder they are treasured California natives. Bigberry manzanita has an extensive range compared to many manzanita species. It can be seen from the San Francisco Bay area south to the foothills of central Baja California, Mexico. It grows primarily on slopes at elevations below 4500 feet in chaparral and woodland plant communities. Locally, Arctostaphylos glauca grows in the Santa Monica and San Gabriel Mountains. 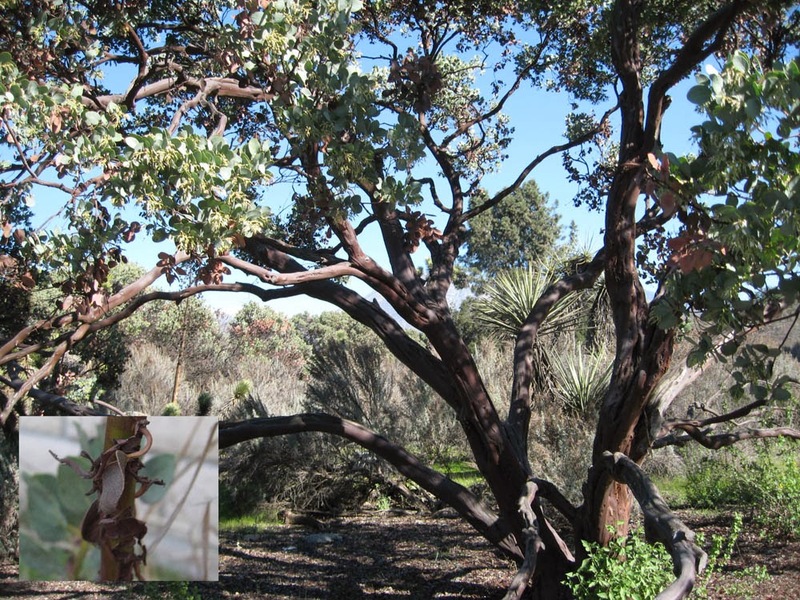 The picture above shows Bigberry Manzanita in a natural setting. In the desert foothills – and higher elevations - Arctostaphylos glauca is often a medium-sized shrub. 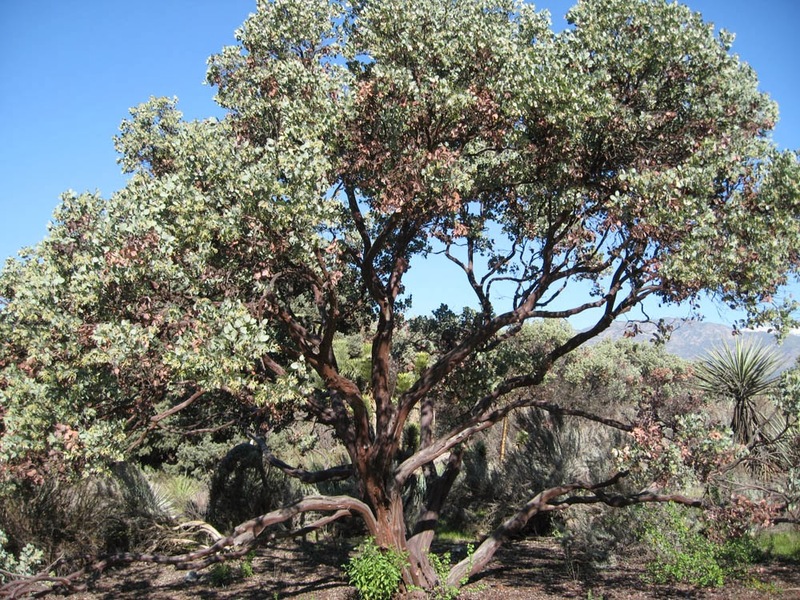 In lower, milder climates, Bigberry manzanita is one of the larger manzanita species. Mature plants are often 8 to 15+ feet tall and 12-15 feet wide. Bigberry manzanita is really a very large woody shrub with an open branch structure and rounded form. It can be pruned up to form a small tree. Its open foliage provides dappled shade, the perfect environment for smaller plants that like a little protection from the summer sun. plant in Mother Nature's Backyard garden (plant is the gray-green shrub along the wall). The foliage of Arctostaphylos glauca is an attractive gray-green that contrasts nicely with surrounding plants (see photo above). The leaves are simple, evergreen, alternate and leathery; a waxy coating gives them their characteristic color. While these features make the species drought tolerant, they also give plants a neat, attractive appearance. Combine the unique foliage with dark red bark and you have a winning combination. The characteristic red, peeling bark can be seen even in young plants (like our specimen in Mother Nature’s Backyard). Manzanitas generally bloom in winter or early spring in western S. California; Arctostaphylos glauca is no exception. The small, white urn shaped flowers can be seen beginning in December or January in most years. Flowers grow in fairly open clusters (panicles) and mature plants will be covered with flowers in a good year. The flowers attract insect pollinators (primarily bees) as well as butterflies and hummingbirds. Along with the native currants and gooseberries (Ribes species), manzanitas are an important source of nectar in winter and early spring. Bigberry manzanita, as suggested by its common name, produces large fruits (about ½ inch diameter) compared to other manzanitas. The name manzanita means ‘little apple’ and the fruits of Bigberry manzanita do indeed superficially resemble small apples (see http://calphotos.berkeley.edu/cgi/img_query?where-taxon=Arctostaphylos+glauca for some good pictures). The fruits, which contain a large ‘stone’ formed from fused nutlets (pits), ripen to a dark red color in summer. 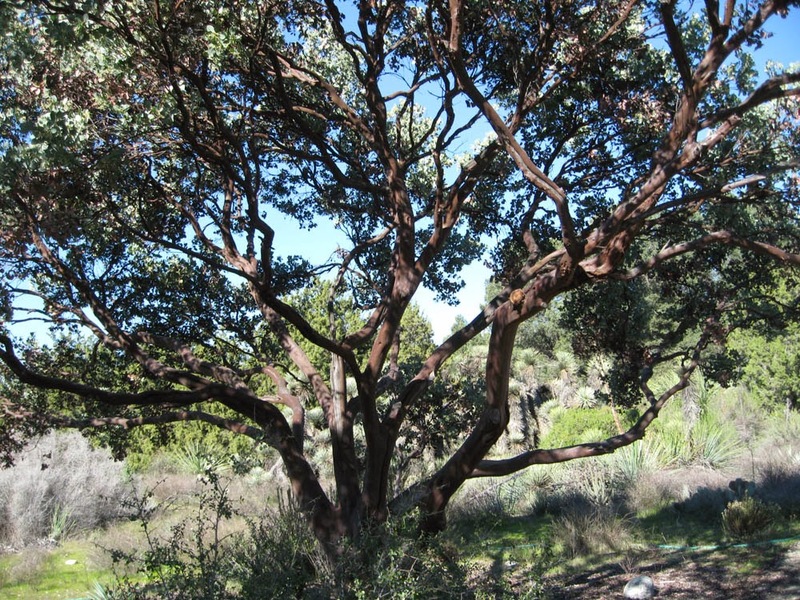 Bigberry manzanita begins producing consistently at about 20 years of age. Production increases until trees are at least 90 years old and individual plants are known to live more than 100 years in natural settings. red-brown. Insert shows bark on young tree. The fruits of Arctostaphylos glauca are showy, but they are also edible. Native Californians collected ripe fruits in summer or fall. They were used either fresh or dried for later use. Fresh berries were used to flavor cooked foods and for making ‘manzanita cider’. We’ll discuss how to make this refreshing beverage in a future posting. Dried fruits were ground into a meal and used for making mush or cakes/bread – or added to soups and stews as a flavoring/thickening agent. Although we haven’t done so, manzanita berries can also be used to make jelly or a sweet syrup. If you don’t use the berries, they won’t go to waste. Fruit eating birds and small animals will take care of the surplus! Bigberry manzanita can be a nice addition to the home garden – if you have the conditions it needs. Like most manzanitas, Arctostaphylos glauca prefers a well-drained soil. In nature, it often grows on sunny slopes with coarse, well-drained soils. 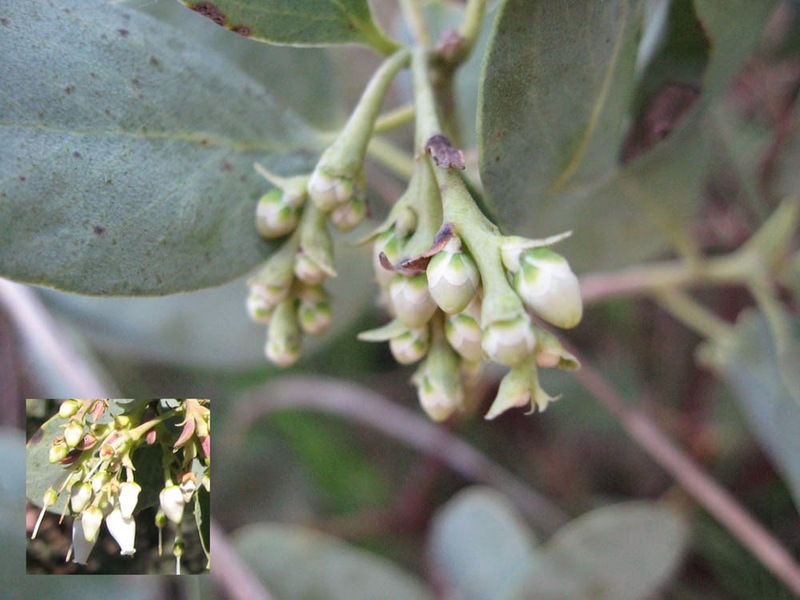 If you have these conditions, Bigberry manzanita will need little care once established. Growing manzanitas in gardens with clay or clay-loam soils can be more of a challenge. 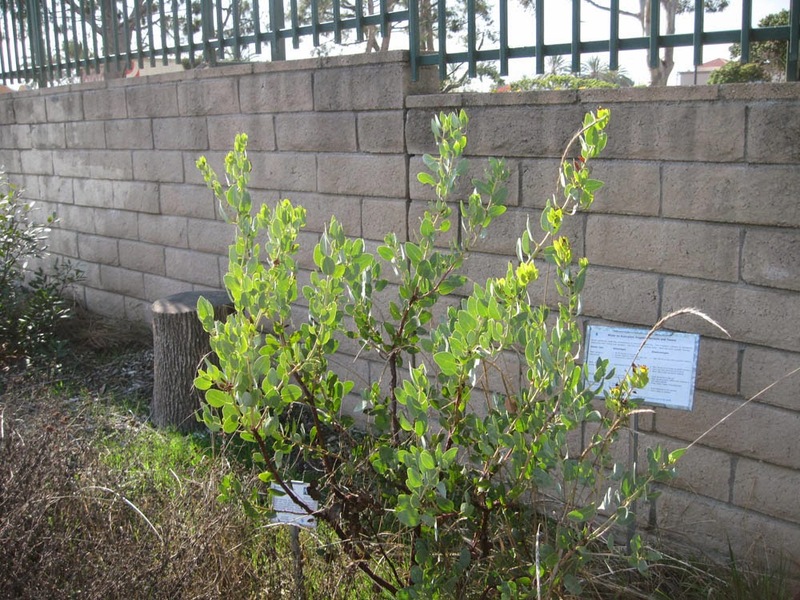 We included two plants (Arctostaphylos glauca and the cultivar Arctostaphylos densiflora ‘Howard McMinn’) in Mother Nature’s Backyard because local gardeners love manzanitas. But we’re well aware of the challenges – and hope our choices succeed. The trick will be to keep them free of the fungal diseases to which they are prone. We watered our Bigberry manzanita every other week during the first summer (2012) and only 2 times this summer (2013). With a little luck, our Bigberry manzanita will get by without any supplemental water from here on out. This is a tough species that likes full sun and tolerates heat, drought, cold and alkali and salty soils. Whether it will survive our ‘junk yard’ soil remains to be seen. One trick if you have clay soils is to plant manzanitas on a 2-4 ft high mound or berm. This will often provide shallow-rooted species, like Arctostaphylos glauca, with enough drainage to succeed, even in less than optimal soils. So if you want to try a manzanita – but your soils are more clay than rocky - choose one of the more garden-adapted species/cultivars and plant on a mound or berm. Then resist the urge to over-water once your manzanita is established. Several cultivars of A. glaucus are available including ‘Los Angeles’, a natural variant from the Santa Monica Mountains and ‘Frazier Park’. The leaves and litter of manzanitas contain acidic compounds that inhibit the growth of some annual wildflowers. You should be able to grow perennial grasses and plants near a manzanita if you wish. If you have trouble with plants near manzanitas, consider growing understory plants in containers, which should alleviate the problem. Bigberry manzanita has many practical uses. It has hard wood which can be used for woodworking or burned. Native Californians used the wood for pipes and tool handles. The green leaves were collected in fall and dried for medicinal uses. A weak tea (decoction) from the dried leaves was used as a diuretic to treat kidney and urinary tract diseases. It should be used sparingly as it may be toxic in large or frequent doses. The tea was also used externally to treat poison oak. The leaves produce a lovely brown dye which requires no mordant.